At 25 years old, Hervé Koubi found out that his parents were Algerian immigrants to France. His Algerian heritage had been hidden his whole life, and once he found out, he felt the need to go to Algeria and see where his family came from. While there he was introduced to the novel Ce que le jour doit à la nuit (What the day owes to the night) by Yasmina Khadra. Although the choreography is unrelated to the story of the novel, Koubi loved the title and all its possible metaphorical meanings so much that it stuck with him and became the title of this work that he began creating while in Algeria. 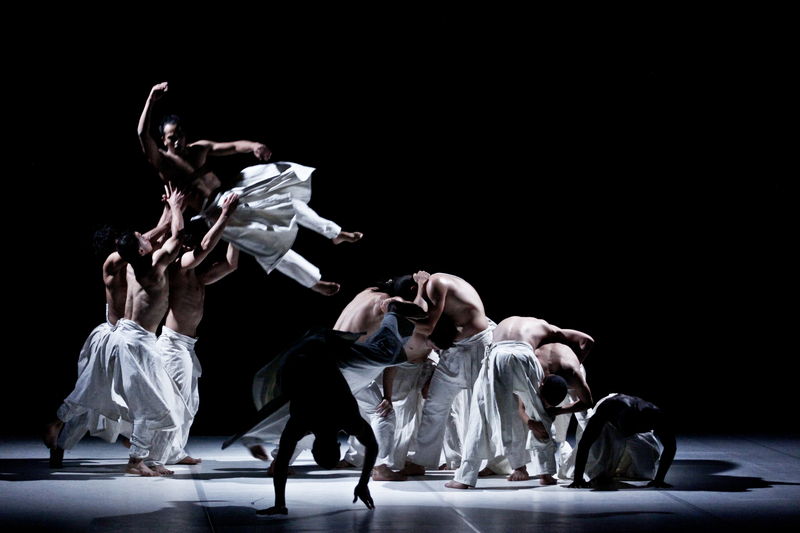 Koubi held an open audition in Algiers in 2009 to find the dancers who would appear in this piece. Although there are no dance schools in Algeria, 250 dancers showed up for his audition. They train in the streets, in underground studios, and mainly at night. Their strength is in hip hop, break dance, Capoeira, and street dance styles. This training is evident in their combination of amazing physical strength and ability to perform flips, hand stands, and head spins, but along with this virtuosity they exude a calm gracefulness that makes every movement smooth, controlled, and full of meaning. The dancers, dressed in white pants with flowing skirts, slowly moved in a cluster on a smoky stage, a mixture of classical and electronic music accompanying them. Moving in complete unison, they kept their backs to us for the opening few minutes of the piece. Moving across the stage in a wave of flipping, jumping and spinning bodies, they were a flowing mass of billowing white fabric. There were always multiple focal points on stage, and it was hard to take in everything at once. One dancer would be spinning endlessly on his head, while others would be flipping each other or running and diving fervently around the stage. There were a few moments of breathtaking imagery that are unforgettable. A few dancers stood with their backs as steps, and another climbed up to the top of their mountain, reached up to the heavens, leaned over, and silently fell into the arms of the other waiting to catch him. In another moment of beauty, one dancer was flipped up to stand on another’s shoulders, they walked back slowly, and he fall backwards and was gently caught. These sequences were so smooth and effortless, yet so full of tension and symbolism. This epic fusion of contemporary and street dance ended with a poetic recitation in Arabic, translated to “I Went There,” a fitting conclusion that left us to think about the deep connection one can have with their ancestry and how that contributes to our identities. In searching for his roots, Koubi found endless inspiration, virtuosic talent, and a deeper understanding of his heritage that translated to this beautiful piece of choreography.